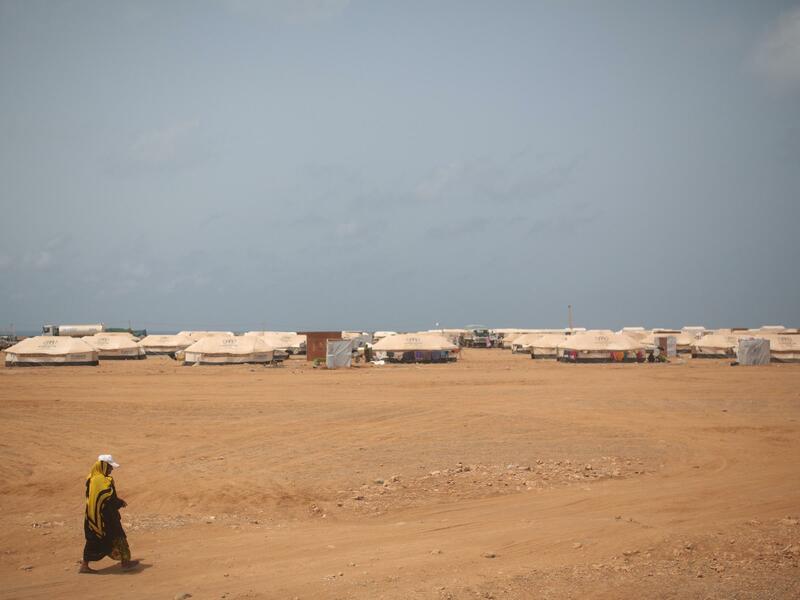 A Yemeni refugee walks to a refugee camp in the small African country of Djibouti. Thousands of Yemenis have come to Djibouti, fleeing their country's civil war. Many of them are trying to get visas to come to the United States. But President Trump's travel ban includes Yemen, which means only Yemenis who obtain a special waiver can come. 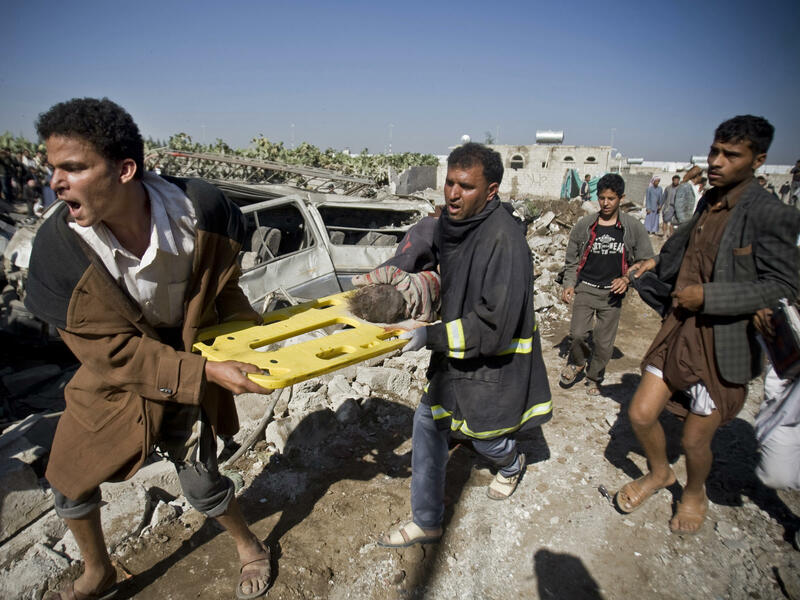 After Saudi airstrikes in Sanaa, Yemen in 2015, people carry the body of a child uncovered from under the rubble. 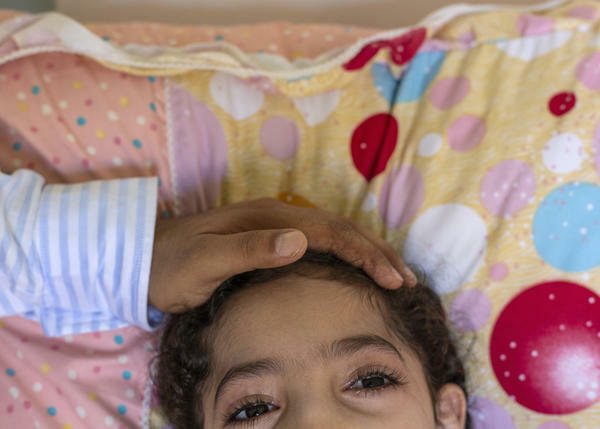 The United Nations has declared Yemen the world's worst humanitarian crisis. When Yemen's war began, Nageeb Alomari decided to bring his wife and daughters to the U.S.
Nageeb Alomari, an American citizen, was attempting to bring his family to the U.S. from war-torn Yemen when the Trump administration instituted its now successfully-upheld travel ban, which included his home country. Nageeb Alomari's daughter Shaema, who has cerebral palsy. 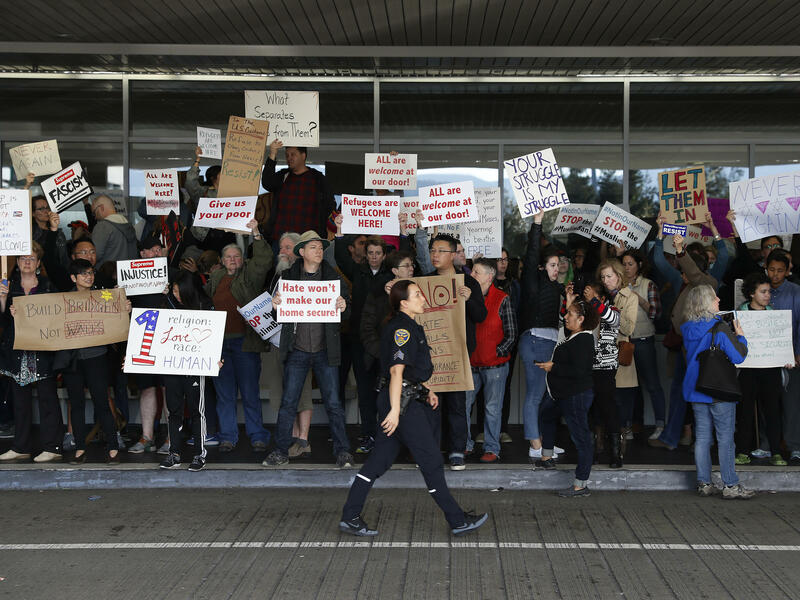 A police officer walks past demonstrators San Francisco International Airport on January 28, 2017 during a rally against the Trump administration's first travel ban. Nageeb Alomari holds his 10-year-old daughter, Shaema, in their front doorway just as he did outside the U.S. Embassy in Djibouti. Nageeb is from Yemen, but became an American citizen in 2010, and later applied for visas for his wife and daughters. Because Shaema is unable to walk on her own, Nageeb carried her to the family's appointment at the embassy. Nageeb Alomari's three daughters in California. Nageeb Alomari now lives in California with his family. Nageeb Alomari has lived the Trump Administration's travel ban. Alomari is from Yemen, and he moved to the U.S. in the 1990s. He worked at gas stations in Alabama, then California. In 2000, he married a woman in Yemen, and they eventually had three daughters. Like a lot of men from his country, Alomari lived and worked in the U.S. and sent money back to his wife and kids, who stayed in Yemen. In 2010, Alomari became an American citizen. A year later, massive protests in Yemen led to the ouster of the country's longtime president. The country became more unstable, and in 2014, a militant group called the Houthis launched an attack and took over Yemen's capital and other parts of the country. And so began the civil war in Yemen that continues today. Alomari was still in the U.S., and he worried about his family, especially his oldest daughter, Shaema, back in Yemen. She has severe cerebral palsy. She can't speak or move on her own. She also needs to take medicine four to five times a day to keep her muscles relaxed and to keep her from having spasms. But she was living in a war zone, where there was a shortage of medicine. In 2016, there was a bombing, right near his family's house. So Alomari applied for visas for his wife and daughters to come to the U.S.
"That's when I decided, they need to be with me," he said. At the same time, Donald Trump was campaigning for president, and promising "a total and complete shutdown of Muslims entering the United States." Just days after Trump's inauguration, on Jan. 27, 2017, he announced the first travel ban. Across the U.S., people converged at airports to protest the administration's ban. Alomari realized his family was now a target of this ban. He was living in San Francisco, working at a gas station, and, after work one day, he went to the airport to join the protests. "I was afraid for my family," he told us. But at the time, he still believed the U.S. would understand his situation and grant his family visas. Not long after the protests, the travel ban was put on hold by a federal court. Then the Trump administration announced a second, revised ban. And that, too, was put on hold. Alomari decided to go back to Yemen and stay with his family until the visas came through. But travel in Yemen was difficult. The main airport in the capital, Sanaa, was closed. The only open airport is in the city of Aden, in southern Yemen. Alomari's family lives in the city of Ibb — about 100 miles away — which means he had to cross a frontline to get home. And there were checkpoints along the way. He never knew which group controlled each one. Eventually, he made it home. A few months later, Alomari got an email from the U.S. government saying the family needed to provide proof of vaccinations to embassy officials. But to do that, they would have to go to Djibouti, the country nearest Yemen with a U.S. embassy. The American embassy in Yemen had suspended operations in 2015, due to the war. Djibouti is across the Red Sea from Yemen, and it's about an hour flight away. So Alomari piled the family in a car to drive back to the airport in Aden. Again, he crossed the frontline of a war. The trip took 15 hours. And it was very difficult for Shaema, his oldest daughter, who has cerebral palsy. She couldn't sleep and cried most of the way. In Djibouti, the family had to start from scratch: new apartment, new furniture, new doctors for Shaema. 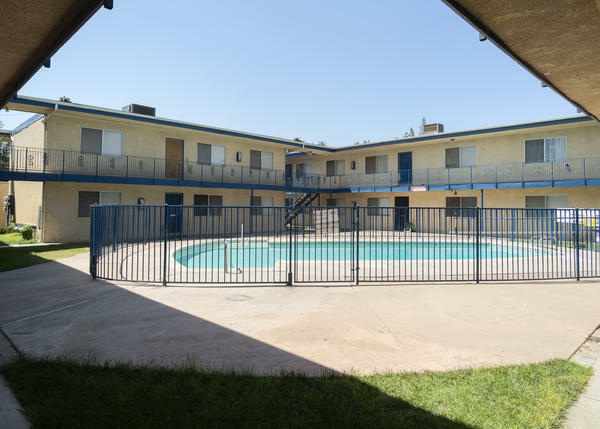 In all, Alomari says, it cost tens of thousands of dollars to live there. Alomari spent all his savings and borrowed the rest. The family got the required medical exam, and eventually got an appointment at the embassy. By this point it was late 2017. Back in the U.S., the Trump Administration announced a third version of the travel ban. And the question of the travel ban's constitutionality made it to the Supreme Court, which ruled the ban will take effect while legal challenges continued. But people from the banned countries who are trying to come to the U.S. — Libya, Iran, Somalia, Syria, Yemen, North Korea, and Venezuela — could qualify for something called a waiver. The waiver is essentially an exception: If you can show you are not a security risk, and that you'd face "undue hardship" in your country, you can qualify for this waiver, and if you get it, you can come to the U.S. But according to immigration lawyers, immigrants, and former officials, few people know how these waivers work. There's no form to fill out. The government says if you're from a banned country, and you have already applied for a visa, like Alomari's family, you are automatically considered for a waiver. But many families have no idea a waiver is even an option. Alomari worked with a Yemeni-American advocate who told him about the waiver and assured him he would qualify. So, in early 2018, Alomari and his family put on their best clothes and went to the U.S. embassy in Djibouti. Alomari carried Shaema in his arms. Alomari watched as two families and one older woman in front of him left their interviews, saying they were rejected. But Alomari was still confident. He walked into the interview room, and the consular officer first looked at the application of the youngest daughter, Lemya. She's five, and she was born after Alomari became a citizen. The consular officer said she's fine; she's a citizen. Then he looked at the other applications — Shaima, 10, Selma, 7, and Asma, their mother — and, according to Alomari, said, "All of you are rejected. We are under a ban." And then, Alomari said, the consular officer added in Arabic: "It's a presidential decision." The interview took five minutes. The children were crying. Alomari was devastated. The family went back to their apartment in Djibouti, and Alomari tried to figure out what to do next. A friend put him in touch with a group of lawyers who represent Muslim Americans, and Alomari told them his story. The lawyers added his story to an amicus brief they filed in the Supreme Court case, Trump v. Hawaii, that would determine whether or not the travel ban would stand. And Alomari also talked to reporters at Al Jazeera and CNN. On April 25, 2018, the Supreme Court heard oral arguments in Trump v. Hawaii. Shaema, Alomari's daughter, was mentioned by the lawyer for the state of Hawaii, Neal Katyal. "A 10-year-old with cerebral palsy who wants to come to the United States to save her life and she can't move or talk," said Katyal. "The 10-year-old was denied a waiver." Then the government's lawyer, Solicitor General Noel Francisco, was asked about Shaema's case. "How do you deal with the example that was brought up of the child with cerebral palsy?" Justice Ruth Bader Ginsburg asked. "Your Honor, the waiver is built to address those issues," said Francisco. "I am not familiar enough with the details of that case to tell you what happened in that particular case. But that's what the waiver provision...is intended to address." Two days later, Alomari read an email from the same consular officer who conducted his interview at the embassy in Djibouti. In the email, the officer said the family had actually been approved for a waiver, but their case was still in "administrative processing." This email was actually sent on April 24 — the day before oral arguments in the Supreme Court. Alomari didn't read the email until April 27. The email should have been good news for Alomari. But he didn't believe it. He said he thought the government was trying to save face. And he gave up hope. "The doors all closed," he told us. About a month later, though, on May 17, 2018, the family got a phone call from the embassy. An interpreter told them their medical records would expire on May 29, so they need to arrive in the U.S. before May 29. The interpreter wasn't saying it out loud, but the family was about to be granted their visas. On May 26, 2018, the Alomari family landed at JFK and were greeted by applause, balloons, and American flags. One month later, the Supreme Court upheld the travel ban in the Trump v. Hawaii case. In a dissenting opinion written by Justice Stephen Breyer, Shaema Alomari was mentioned. He wrote that it appeared Shaema got the waiver because of "international attention" to her case, which is "more reason to believe that waivers are not being processed in an ordinary way." He also pointed out that, even though the administration said it would provide guidance on how to get these waivers, there still was no guidance. The State Department says "there is no separate application for the waiver," and that decisions are made "on a case-by-case basis," wrote Breyer. Meanwhile, many people in banned countries still don't even know there is a waiver. The State Department says, as of now, more than 1,200 people have been "cleared" for a waiver. But it's not clear if they have actually obtained the waivers. The State Department declined to provide current figures for the total number of visa applications, though the Department has previously disclosed there have been more than 30,000 applications from banned countries, and that number has certainly increased. "We should put all 30,000 names in an amicus brief, and maybe then everybody will then get a waiver," said Chris Richardson, a former consular officer, who recently resigned. He said the Alomari case is the exception, not the rule. As for the family, they are now living in California. Shaema is stable. Her mother recently got a green card. NPR producers Chris Benderev, Noor Wazwaz and Tom Dreisbach contributed reporting to this story.